Years ago I shared at and event, “one of the greatest tragedies is for people to go to their grave with their music still trapped inside of them”. I was only a year or two out of university when I did that event and I don’t think I truly appreciated the magnitude of that comment. Now that I’m almost 40 I have a much deeper appreciation for the gravity of that statement. For a long as I can remember, I have always believed I could do the impossible and for as long as I can remember, I’ve always had people tell me no I can’t! People from every area of my life: family, friends, classmates, teammates, teachers, managers and colleagues. Even though I did not come from an affluent background and even when my circumstances showed no evidence of success, I still believed I could do anything. Then I went for my dream, acting. Before I started my acting journey I had lost my fair share of battles but somehow, some way I consistently managed to pull off the extraordinary. However, my deep fear was what if I could not do the extraordinary with acting? What would it mean if I didn’t succeed as an actor? It was terrifying. To me, it meant that all the naysayers would finally have their day. They would be right, I can’t do the impossible. It meant all the condescension and ridicule was accurate and I was a fool for trying. But I went for it anyway. Right out of the gate everything seemed like I was manifesting my destiny. I landed my first 5 auditions. They were all paid on camera, principal roles. In fact, the director for my first gig, is the now the director of “The Hunger Games” franchise, starring Jennifer Lawrence. However, 10 years after that first gig, I really wasn’t getting to a place where I could survive from my acting work. Suddenly the sting from the comments from family, friends, classmates, teammates and colleagues were taking their toll. I began to feel unworthy of discussing any of my goals, I began to view myself as second class (and lower).I didn’t have a lot of friends, I didn’t have a fancy job title, I didn’t have a business, I didn’t have a lot of money…suddenly I began to apologize for thinking big. I started to believe the naysayers. I turned away from my nature and buried my talent and accepted my role as a guy who can’t make it happen. I accepted that they were right and I was wrong. I didn’t have the talent, the ability or the intelligence. Whatever jabs they threw at me I accepted them as truth. Anytime I began to say what I was working on I was quickly met with eye rolls and condescending tones and comments like “no you can’t” and I accepted it. After all I was a guy who couldn’t deliver. When you make a decision like that…it can destroy your world. Here’s what I mean, during that same period: I won multiple sales awards for the companies I worked for; Tony Robbins in front of 2000 people said to me personally “I am more like him than I realize”; Oprah Winfrey celebrated my writing on her show and shared it with the world and I had helped over 8000 people take their lives to the next level and through it all I still saw myself as a bottom feeder. The danger of taking on beliefs like: they were right; I’m not good enough; or no I can’t, is you can have great things happen to you and you won’t even recognize it. The universe could be telling you exactly where it wants you to go and you could miss it! What’s worse is you start to apologize for who you are. You allow your voice to drift into the background. Your mindset shifts and it becomes ok, to go unnoticed because you don’t want to rock the boat. All that matters is fitting in. However, the trouble with that is, trying to fit in…kills whatever gifts God has given you. 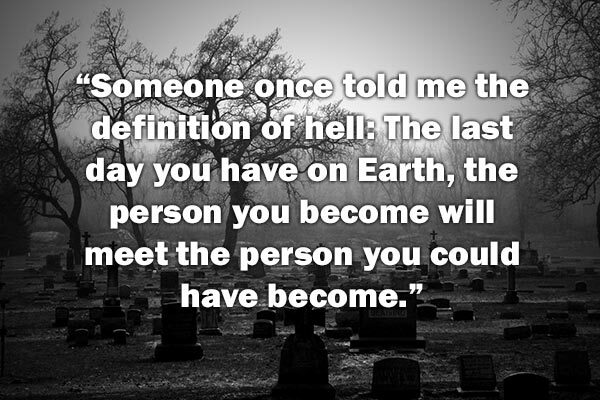 Consider this, someone once told me the definition of hell is: the last day you have on Earth, the person you become will meet the person you could have become. Allow who you are to come out even if you fail at first, even it rains on your parade. I tell my clients all the time if you could see it, if it made sense…it wouldn’t be faith. If we let the setbacks and disappointments stop us it’s truly possible that we will go to our grave with our music still trapped inside of us.